I’ve always intended my blog to be a humorous take on life. Although I have certainly written serious pieces, they have mostly been about close friends and ordinary people I’ve met who have inspired me in some way. But those are a small percentage of the number of pieces I’ve posted. I’ve set some kind of record now. I’ve written two serious pieces in a row. Last week I wrote one about my friend Janice and about how dying can be as life-affirming as living. This week, I’m writing about the March for Our Lives rally I participated in on Saturday in Washington, DC. Now Husband always says that we are living in extraordinary times. By that, he does not mean that things going on now are amazing and phenomenal. He and I agree that the opposite is true, that the times are unusual, astonishing, and uncommon. We agree that we have lost our direction as a country. And we also believe that many Americans who feel as we do feel unable to do anything about this frustration and this fear. We are too small, and “they” are too powerful. And so we go around being depressed or being irate or seeming to be oblivious. But, whatever the reaction, the result is the same: We do nothing. And then, on February 14 of this year, a mass shooting occurred at Stoneman Douglas High School in Parkland, Florida. One 19-year-old gunman, in the span of six minutes and twenty seconds, killed fourteen students and three teachers. He injured fifteen students, some of them quite seriously. Thirty-two people in little over six minutes. He did it with the help of an AR-15 rifle, capable of shooting 600 rounds per minute. The AR-15 is legal in this country for civilian use..
Stoneman Douglas was yet one more predictable mass shooting in a line of what has become almost too many mass gun shootings to count. As with the others, our politicians put on their serious, compassionate faces and extended their condolences and prayers. As with the others, people gathered. Vigils were held. Candles were lit. Tears were shed. Heads were shaken. People were embraced. Hands were held. With others, a flurry of attention was given to the matter of gun violence, before attention was directed elsewhere. As a country, we moved on. This time, things were different. Like everyone around me, I was devastated by what happened at Stoneman Douglas. But, while I have always been horrified by gun violence, I had never given much thought to the NRA. Then, a couple of years ago, a gun store rented space in a small strip mall at the edge of my neighborhood and prepared to move in. The result was that it ignited neighborhood activism. It was then, in an attempt to help with the neighborhood effort, that I began to really look at how the NRA operates. I did a ton of research, and I gave equal time to pro-gun rhetoric. In other words, I got “smart” on the NRA. Now, when I hear the rhetoric, I see how the actual facts have been manipulated and/or distorted. My research did not turn me against law-abiding citizens who, for a variety of reasons, own non-military weapons. But it did open my eyes to the danger the NRA poses to this country. Eventually, we won our fight and the gun store went elsewhere. It was an exhausting experience. But I am grateful that it created a need for me to put emotion aside and look at the reality of the influence of the NRA in this country. I was now able to look at Parkland in a different way than I had looked at previous gun massacres. I was able to shift a lot of my anger away from the shooter and focus instead on the biggest underlying cause of gun violence: the promotion of guns as a way to solve problems and the subsequent ease of obtaining such guns, and a complicit political system that derives much of its money from one of the most powerful lobbying groups in the country. Hunting and target practice aside, it is fear that drives many people to own guns. And it is the Second Amendment, waved in our faces like some new American flag, that turns that fear into something looking more like honor. Gun ownership, for many, has become a badge of patriotism. Along with this, the NRA uses the Second Amendment to justify unacceptable gun-selling practices, and allowing civilians to own military-grade weapons. The truth is a bit different. Money and power, not adherence to the Second Amendment, is what drives the NRA and the politicians it supports. The NRA was created in 1871. It was founded in order to advance rifle marksmanship. At a time in our history when far more people actually hunted for their food, this was a worthy mission, indeed. In the 1930s, the NRA began its first lobbying efforts. Then, on May 21, 1977, the modern NRA was born. Firearms became big business. The NRA is now a fierce political organization and one of the most powerful lobby groups in the country. It has five million members, mostly responsible, law-abiding citizens. They comprise roughly one and one-half percent of the population, a miniscule number. And yet the reach of the NRA affects every citizen in this country. It’s the great American success story, unfortunately with results like Columbine, Newtown, and Stoneman Douglas. 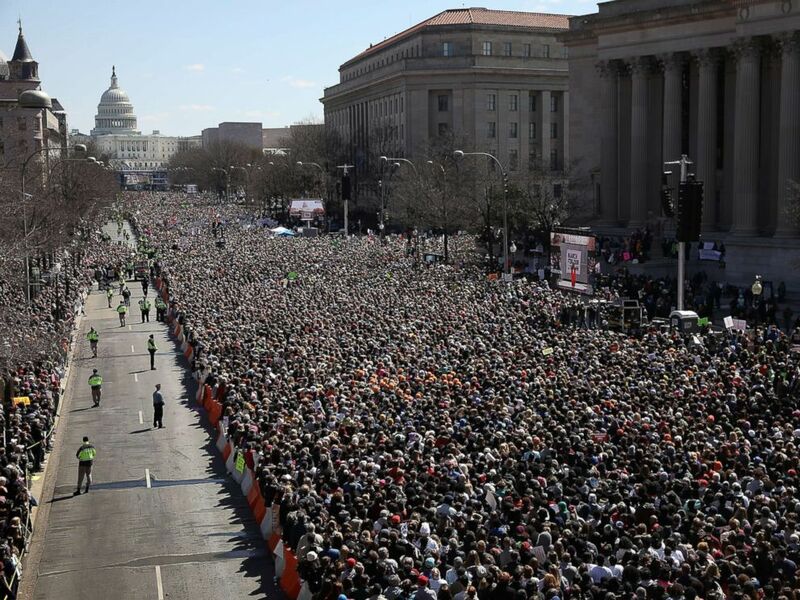 And it was this, the Parkland students’ voices and their use of social media that resulted in half a million people assembling in Washington, DC and close to two million others in 800 other marches across the U.S. and the world. Their unifying message, repeated over and over, was this: Enough is enough. Never again. Vote them out. I stood in the massive gathering along Pennsylvania Ave, on a direct line that led to the nation’s Capital. I listened to the music and to the speeches. I read the countless handmade signs all around me. I laughed, I cried, I applauded, I raised my fist, I felt chills going up and down my spine. Most of all, I marveled that these young, articulate, committed children (as young as the nine-year-old granddaughter of Martin Luther King Jr). were doing more than addressing gun violence in this country. They were addressing the moral decay that has been eating away at us for decades. They were standing up to the most powerful of us, those whose greed overrides any sense of moral conviction they might have. They were looking the beast straight in the eye and telling it its days were numbered. I have experienced many moments of intense pride in my life. For most of my life, I have experienced intense pride in being an American. Since November 8, 2016, that pride in being an American stopped. I couldn’t imagine that it would reawaken any time soon. These kids, not yet adults themselves, have not only reawakened my pride in my country, but even more, in my hope for a moral turnaround. These kids, not old enough to vote, have started a revolution in the political process. Their words will continue to resonate with me as I, inspired by them, continue to take action: Enough is enough. Never again. VOTE. THEM. OUT. BRAVO!!! Eye opening information.. I always enjoy your posts, whether serious, funny or in between. I have been affected the same way. I know the parents of the slain babies at Newtown tried very hard but somehow it didn’t take. This is taking. It’s shades of the 60s. I marched then. People were beaten and hosed down but there was change. I am cautiously hopeful. We have one hunter in our family. He does not shoot for sport. He has no use for automatic equipment. While I don’t like hunting in general he processes and eats his kill. The rhetoric coming from the NRA is getting so off kilter and bizarre that I can’t believe all gun owners agree. Would Charlton Heston really approve of what’s going on now? Let us be led by teenagers who are committed to a better life. The rhetoric has been so successful that people hold guns up with the Bible (Come to think of it, another huge marketing success story). I have no desire to change anyone’s mind about guns. Instead, I will work toward changing things at the ballot box. As a bystander-Canadian, I would like to say, well-done. Hopefully, more Americans start feeling this way: “addressing the moral decay that has been eating away at us,” and it has nothing to do with religious fervor, which also seems to be strong in your nation–which seems such a strange contradiction to me. Many evangelicals have lost their moral way, as well, and this observation is coming from other prominent evangenlicals. We are eroding on all fronts. Thanks for this great essay! I will share it far and wide! Very well said!! I am glad that you actually were able to take part in the March and witnessed this event first hand. I was so impressed with the speeches by these young people and cried at times at their anguish they have experienced. But there is a part of me, that still feels so beaten down by the Orange Era Leader and his still relentless hold on some people who will do his bidding and continue to do bad things for the USA for no other reason than to remain in his favor or some groups favor. Sometimes I shudder at the thought of next couple of years he remains in power and the havoc he can still reap. I am praying and always open though to the thought of real change in the “right” direction – just don’t have as much confidence as I am comfortable with. Mary, thanks so much for these comments. I’m going to stay focused on changing things at the ballot box. That’s where our power will be. Thanks for addressing the issue in your blog LBL. I wish I didn’t have to write about topics like this. Then again, I wish the citizens of this country were sane, rational, principled people. Ah, a real fantasy, I know. We’ve always been a little coo coo, but it’s gotten so bad it’s painful lately. Yeesh. Well said. I’ve always thought the NRA were simple fear mongers to get power and money. Power and money. It’s what makes the world go round. Ana round and round and round…. Cheers to you Renee! Powerful words and passionate enthusiasm towards our youth. We need to stand by their side! Yes, they ARE our future. Oh, how I wish I had been able to join that march. I know that it was for the young, but as an oldster, I so wanted to be able to show support. This is an amazing thing, what they have done. I hope that it will continue, and show this generation that they have power and standing to effectuate changes in this country. VOTE! I am energized and hopeful, at the potential this generation has. I will do anything I can to support them. They are our future. We’ll use all the support we can get. Thanks. Thanks, Val. I’m heartsick that tragedies like this create a need for such words. Love your post! We, the youth of America, who have raised our voices in the midst of tragedy fortify me with hope and the recognition of our efforts by people like you serve to amplify our voices, so thank you! We may not be able to vote yet, but we will use everything we have to make an impact. Thanks you for these words. I’m in awe of the power and the potential your generation has shown. This grandmother has been inspired beyond measure. I promise to do whatever I can to continue to amplify your voices. AMEN, AMEN, AMEN…LET IT BE SO. Adding arms in the air. Well said!! I myself am a student, so this topic hits very close to home. Feel free to check out my blog post about my feelings on this! Thanks! Yes, I can already see that these kids are up against a wall of opposition (and worse) So far, thakfully, it seems to be making them only stronger.